Until this afternoon I had a mama hen sitting on eggs in the nursery. Did you catch the past-tense? 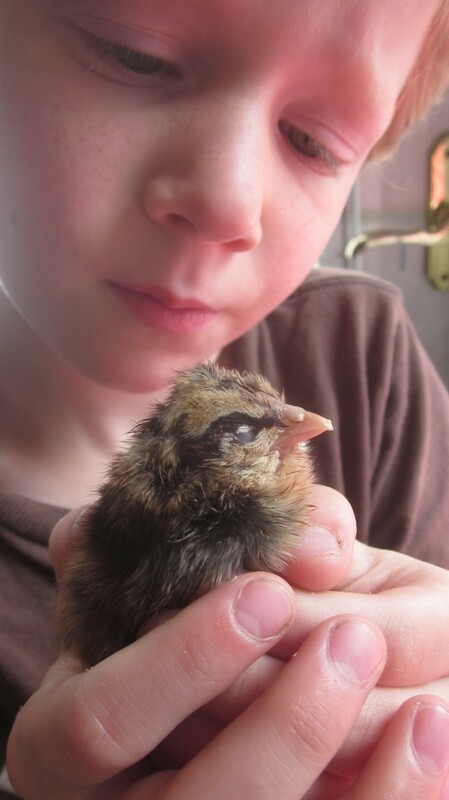 This afternoon when I was walking out to the chicken coop, I heard a loud peeping of a not-being-cared-for chick. It always amazes me how loud the peeping of such a tiny creature can be! I wasn’t aware that the chicks had begun to hatch. 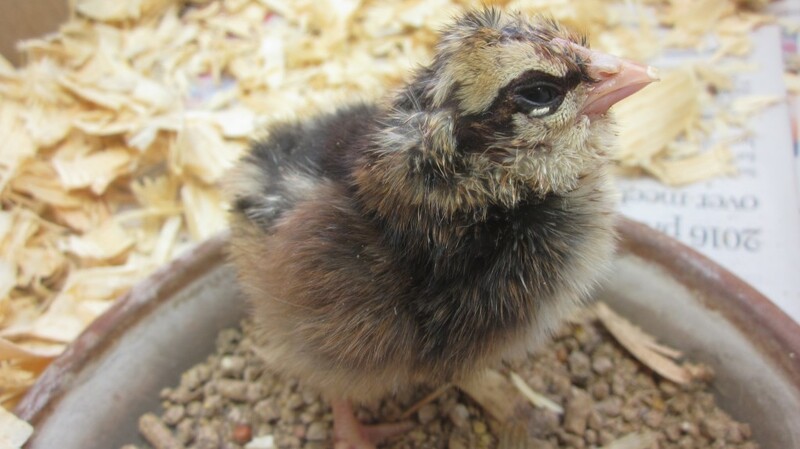 I hurried to the nursery, to find a tiny just-hatched chick, but something was wrong. He wasn’t tucked under the hen staying warm and cozy, like he should have been. Instead, he sat a good space away from the mama hen, and he had blood on the side of his head. Oh, shoot, I said as I glared at the hen. Not again. 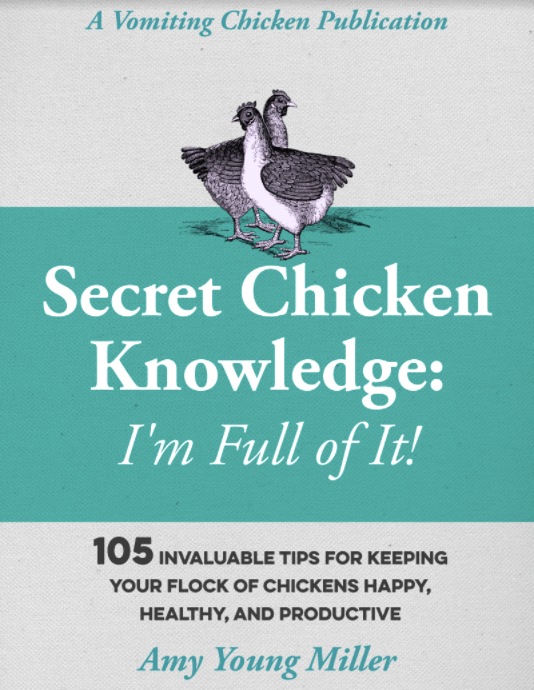 This had happened before with a different hen, and I chronicled it in the story about Ginger the Chick Killer. Sometimes it happens: a broody hen will sit for three weeks on eggs, and when they start to hatch, she will turn on the chicks viciously, regarding them as interlopers. Ginger actually killed one chick and nearly killed a second before I caught her and rescued the remaining eggs, allowing my son Andrew to fling her out of the nursery. I never let her sit on eggs again, and indeed I think she ended up in the soup pot before her coop mates. Chick killers don’t last long at our place. I was so disappointed in this hen, who, by all accounts, was as bland and relaxed as she could be. I guess you just can’t tell by looking at a hen if she’s going to be a successful mother or not, eh? I removed the remaining eggs from her immediately, moving them into the incubator in the house, and brought the just-hatched chick into the house, too. Hopefully enough other eggs will hatch to provide this little chick with some company, within the next day or two. We’ll have to just wait and see. Malachi immediately named the chick “Bilbo Baggins.” There is something so charming and sweet about watching a mama hen raise her chicks . . . I was really looking forward to watching this mama raise her chicks. But she blew it, and so we’re going to be raising a few chicks this fall, ourselves. Little Mack doesn’t mind one bit. He’s very sympathetic to orphaned chickens. 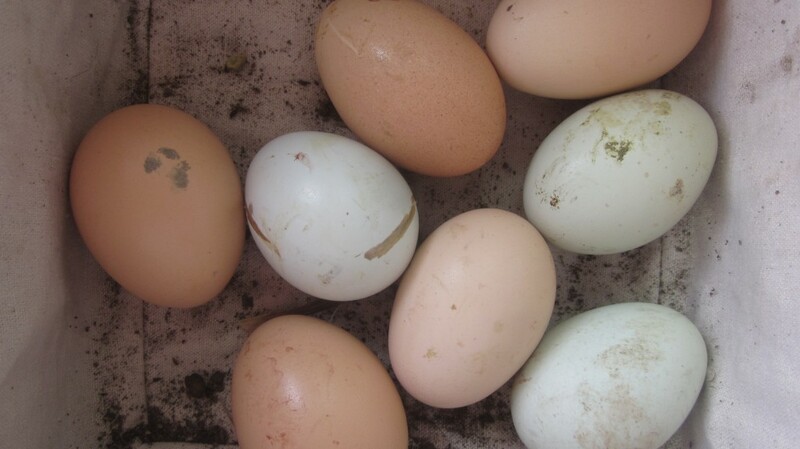 Here are the remaining eggs, which we put right into the incubator in the library. All from different mamas and papas, as you can tell. Here’s Bilbo Baggins in his temporary home in a box in the library: waiting for his friends to hatch. I really love those few yellow eyelashes on the underside of his eye, don’t you? Sweet! Do you know what I love? I love this little furrowed brow, as sympathy washes over my little boy’s tender heart. He feels strongly for this bitty wounded chick, and he will someday be a great big strong man who I hope will be tender and kind to creatures not as big and strong as him. That’s what I love. Perhaps during the night or tomorrow we’ll add to our little flock. Until then, Gentle Reader . 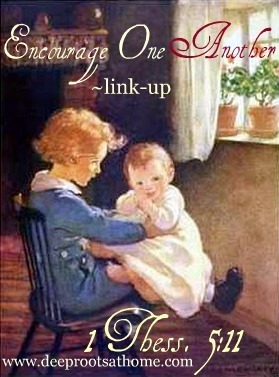 . .
I’m linking up with an awesome, encouraging event over at DeepRootsatHome.Com. It happens every Wednesday, and if you are so inclined, you might want to check it out! ← Get the most out of your Farmer’s Market! Aww…I love that little furrowed brow, too. Stupid hen! I guess DramaMamaFive is now also DramaMamaClutch! haha Roy! Plenty of drama around here, that’s for sure! 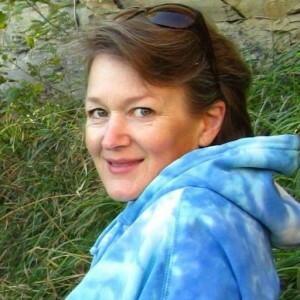 Amy, your stories always inspire me and bring a bit of sunshine (or a lot!) to my day. Those pictures of Little Mack and Bilbo are about as tender and full of innocent grace as they come! You have no idea how much I appreciate you sharing. The thing I miss most about having moved off my farm is a tight raise between my chickens and pigs, but I am going to have to give the slight edge to the chickens. Really look forward to seeing what is going on with the chicks coming up. I really enjoy how you were able to turn the situation around into a positive experience for both Bilbo and Malachi. Thanks Gary. What else can you do, eh? But does little Mac know which chicken will be in the next chicken Pot pie? Mama did her baby wrong and paybacks are well they are what they are. The chick is so cute, what kind of chicken is he? I know very little but expect to be learning a lot about them very soon. Starting with questions addressed to you.. 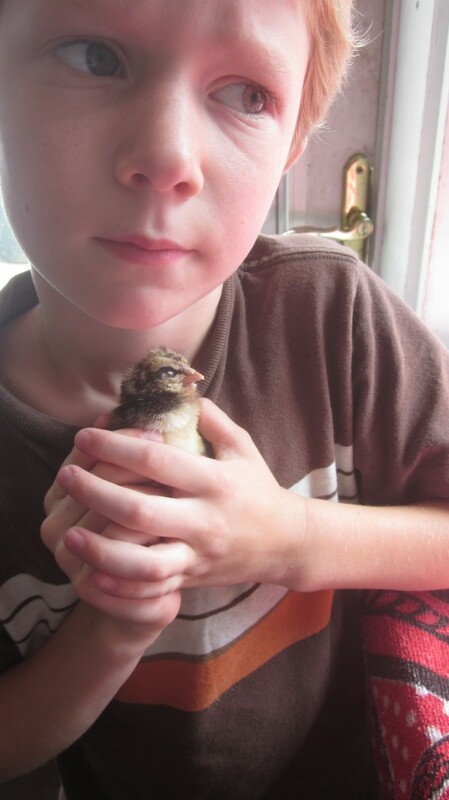 Since I don’t separate my roosters and hens for breeding purposes, this little chick is of mixed parentage. He hatched from a blue green egg, so I know that his mama was an Americauna but his papa? Anybody’s guess! I have one speckled sussex rooster, and several bantam roosters, and all of them take their responsibilities quite seriously.. .
Bilbo Baggins is a lucky chick. He has a Little Mack in his corner! Oh Amy! Those photos are fantastic! You’ve captured such tender moments. I will hope for the best for the little chick and the others! Poor Bilbo! Still, as you say, it’s a new project for Mack. What’s happened to the psycho hen? How sad. We haven’t had the hen beat up the chicks… was the rooster. Now that I know that you can move them when they sit… I may do that next time. Our 6 chicks are doing very well and are half grown. Hope you other ones hatch and do well. Uh oh killer hen on the lose! Did Ginger become chicken pie? Ginger did, indeed, end up in the freezer, Sophie. So pleased the chick is ok, what a wondrous little chap little Mack is 🙂 I’ll take it as read that Ginger the homicidal chicken is no more? I definitely agree about the importance of teaching empathy in a child’s socialization. Or maybe sympathy? I enjoyed watching Dumbo with my son and my niece when they were two, and asked them how Dumbo’s mother felt when he was taken away, and how Dumbo felt being away from his mother, and they definitely learned to empathize. Oh, Kenny, that movie always made me cry! Hmmm… I have known of real mamas like that. Sad, but a happy ending at your hen-house.